One ongoing research is to develop food that can be matched to mine or your genotype to benefit our health and enhance normal physiological processes. This will lead to a personalized diet advice which may help to prevent monogenetic (=inherited disease controlled by a single pair of genes for example Cystic Fibrosis; Huntington’s Disease) and polygenetic diseases (=inherited and controlled by several genes at once for example cardiovascular diseases, high blood pressure, obesity, diabetes type II, Cancer, Osteoporosis and high cholesterol levels). It may sound science fiction right now cause until now all commercial companies ( e.g. Genelex, Sciona, TheDNADiet) who want to profit, just screen for 19 genes utilizing a multiplex technique that detects several SNPs ( Single Nucleotide Polymorphism, substitution of one nucleotide 1bp (point mutation) SNPs are located in regulatory sequences which belong to non coding region of the human genome. SNP could influence the transcription activity of other DNA regions. Most SNPs in that region have no effect.) simultaneously. This technique can be largely automated and is inexpensive. The 19 genes to be tested are coding for the following enzymes and proteins to mention a few MTHFR, PPARg, GSTM, VDR, IL-6, APOC 3. These are based on variations in the genes whereby they are not sufficient to give a personalized diet advice. The genes tested for SNP are involved in complex metabolic pathways. Current diet advices based on genetic tests don’t take complex metabolic pathways into account. After all there is lots of research needed. The aim is to look for an approach that helps to solve the biochemical mechanism by which nutritional components like fatty acids influence health. One method is to use oligonucleotide microarrays to measure gene expression profiles of healthy individuals who regularly consume fish oil enriched with Ω-3 to individuals with no fish oil consumption. The results will show effects of fatty acids and other components in fish oil on gene expression, although for the greater amount of genes detected the exact function remains now unknown. 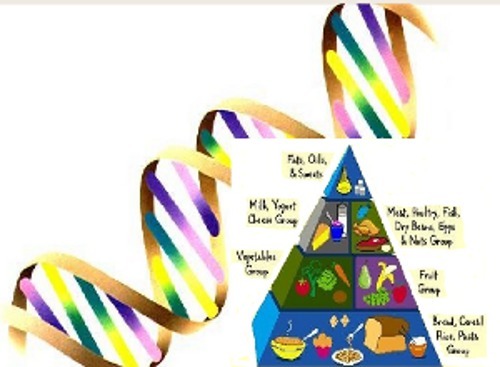 What we benefit are genomic signatures that are associated with certain nutrients, diets or diseases. One can consider it as a fingerprint of a physiological or pathophysiological state or fingerprint of the phenotype. In general the phenotype is determined by the genotype and external factors as lifestyle and nutritrition. Therefore it is possible that a certain genotype (polymorphism) leads in different people to different phenotypes. Sometimes there is a clear relation between genotype, phenoype and effects of certain nutrients. Most times the relation between genotype, external factors and phenotype are complex. For example coronary heart disease is determined by the interaction of several genes and polymorphism of those genes including external factors. They are polygenetic complex diseases,also not all genetic factors are known to give a personalized diet advice. In all there is a lot more to know about nutrition, genes and metabolic diseases. It has been a month since I subscribed myself to the certified e-online course offered by the European Nutrigenomics Organisation (NuGO).It is a network connecting researchers from across Europe and beyond to work together and share their expertise upon linking genomics and nutrition with research on health. Nutrigenomics can be defined as the study between food constituents (macronutients and micronutrients)and its effect on gene expression. Many articles show that nutritional supplements improve many metabolic abnormalities by enhancing specific biochemical pathways. The aim is to find genetic markers that have an impact on diet related diseases like diabetes type 2, obesity etc.. Through enrollment to 2 training courses (Molecular Nutrition and Genomics, Polymorphism and Responsiveness to Diet) I have access to the NuGO site for 3 months. Weekly I get newsletters from renowned scientific and medical magazines and read about newly published articles. Though the Courses are directed towards dietitians and Nutritioners to explore the emerging science of nutrigenomics, it invites also other work fields related to biological science or equivalent to participate and contribute to the NuGO community. New findings in nutrigenomics will be important because testing for associated genes may be useful for advising personal diets based on genetic tests. There are several companies around the world profiting from consumers by giving them the illusions of advising personalized diets through testing the consumers genes. The fact that remains unsaid is that all testing constitutes of screening for variations in 19 genes, which is less than 0.1% of all the genes ( approximately 30000 genes in human).There are many more (unknown) variations which could be important for a personalized diet advice but these are ignored by those companies. These so called advertised personalized diets are in fact general diets and are nearly advising the same as the dietary guidelines of “The American Hearth Association”. Other companies base their advice on results of lifestyle and food questionnaires the customer filled in. This advice is of course personal, but not based on the genome. Some times such advice is called personalized diet advice. However, most of the time this advice is called tailored advice. Before I visited NuGO I was myself lured into that lie believing that it is true and not thinking about the idea that people do market the idea of testing the individual’s genetic makeup. For myself as an emerging biotechnologist I found those topics very much interesting and wanted to learn more about it, this way I can profit from the new knowledge that I acquire and expand thereof my scientific know-how in nutrigenomics and biotechnology.